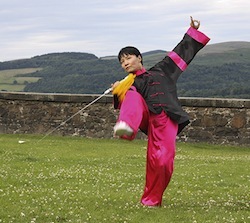 Faye Yip is a Qigong and Taijiquan teacher based in the UK. 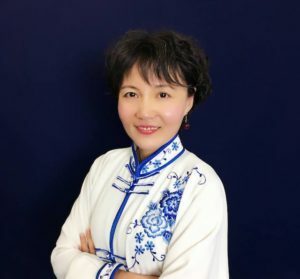 Together with her husband, Tary Yip, she initiated the British Health Qigong Association (BHQA), promoting Health Qigong and Taijiquan in the UK. The BHQA is affiliated with the International Health Qigong Association, whose origin lies in the People’s Republic of China, the Chinese Health Qigong Association being their biggest branch. With high-ranking contacts to the official Taijiquan community and family ties back in China on the one hand, and her own family and teaching life in the UK on the other hand, Faye walks between the worlds. When not teaching on workshops in various countries, Faye and Tary are based in their own school in Telford, UK. The school is also the international branch of the Deyin Taijiquan Institute, founded by Faye’s father, Li Deyin, a prominent figure in the development of Taijiquan in China. When did you start Taijiquan or Qigong? With which one did you start actually? I started on wushu, which is like kungfu, Shaolin style when I was about seven or eight, just when I started primary school. At that time, there were not too much other alternatives, playground alternatives. And I just love all the martial arts: the movements – I find them really fascinating so I just picked it up. And luckily I have family guidance – very easy I could find teachers and so I just started. It is like something joined to me in the spirit, in the way they move and they freely use their bodies and the balance… So I started on kungfu and then I started on Tai Chi, proper training, when I was about eleven – I think ten or eleven. Just thereabouts something in Tai Chi attracted me. Again I started. – So, Wushu is the general name for all the Chinese Martial Arts. It literally means the art of the martial skills and of course Tai Chi is a branch within that. We speak of Tai Chi as a separate thing now, but when I say “when I started wushu”, it’s more about the speed, the power, the external aspect of training – but you can never segregate completely the external training with internal training. They always in some balance go hand in hand, but when you are smaller and younger you couldn’t see the inside and so all you see is the power and the speed. So you started with Kungfu first and then “proper Tai Chi training” – that’s what you said. How did it continue? It was on a weekly basis and every week it was a lot of fun to me at the time. Training was always enjoyable and not a chore to go. I had friends train with me, we were part of a team, we encouraged each other and spurned each other on. So, lots of laughters in my memory when I was training as a youngster. Also, lots of hard, hard work as well, but hard work always kind of paid back as progression and friendship and all of that. It was a regular thing. I looked forward to training when I was young all the time. Okay, that was when you started around eleven years old, when you started Taijiquan – and how did the journey continue? It went on and on and I was involved in demonstrations and competitions. That’s what was available at the time for training and so it always grew as a part of me. My hobbies always evolved around that. I made a lot of friends along the way and I guess it has given me a lot of confidence, because I wasn’t quite extrovert growing up, in school. I wasn’t kind of the loudest, kind of the most outgoing – so this is my way of making friends and develop my own confidence. That helped me a lot in my study and as well as getting medals in competitions. Until I was in college, I started… – I went to university and when my friends started to know I was doing Tai Chi and Chinese Wushu, some of my mates wanted to learn so they said: Can you teach, can you teach? – so I started a little bit of teaching from there, from the university college, until I came over, till I went to the UK. – So that was pretty much the development if you like. I travelled with my father to his training camps a lot and I met a lot of high level, elite level of athletes. I’ve learned a lot and when he travels, my father goes around to parts of China to compete. He used to take me and I would watch and learn at lot of the old, experienced people – both athletes and teachers. I took the opportunity joining on travel to learn from different people, different athletes and their coaches as well. So that’s all part of how I felt about it, you know, as a friendship that develops and gives me confidence [and] more insight of the experience of the people who have done a lot before me. This interview was taking November 2016 in the Tai Chi Studio after an 8 Brocate Qigong workshop in the Tai Chi Studio Hannover, Germany.